Sandhill crane, Grus canadensis taking flight. 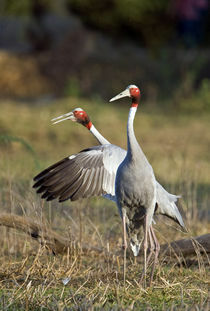 Indian Saras Crane, stretching wings, Keoladeo National Park, India. Three snow geese in flight, blue sky, Bosque Del Apache, New Mexico, USA.